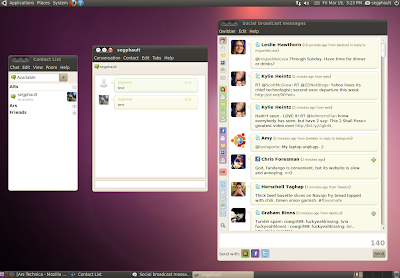 Ubuntu 10.04 codenamed Lucid Lynx is on the verge of its final descent. A lot of new things are coming your way. Ubuntu Artwork Pool in Flickr is buzzing with activity, so is the awesome Community Contributed Themes at Ubuntu Artwork Wiki page. But apart from these eye candy, in a more subtle way, a number of new applications are also in the pipeline. Let's explore these new comers. The buzz word is social, and you can't have a distro without a microblogging client these days. The world is more twitterish and facebookish than ever before and hence comes the Gwibber microblogging client. 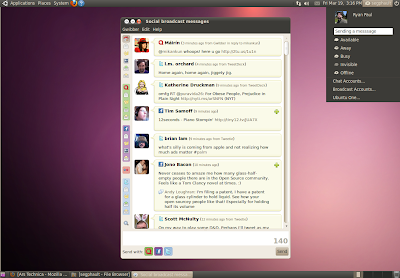 Gwibber is arguably the most popular microblogging client application in Linux(at least in Ubuntu) and it comes as default in Ubuntu Lucid 10.04. That is indeed welcome. Gwibber supports all popular social networking services like Twitter, Facebook, Identi.ca, Digg, FriendFeed and so on. Allows you to interact with many different social networking services. Provides a combined stream of all your messages. Automatically shortens URLs as they are pasted. Built-in search tool and support for saved searches. Users can easily customize Gwibber's look and feel. Out goes the powerful image editing software called Gimp, and in comes the video editor application, PiTiVi. PiTiVi is a free and opensource video editor application for Linux. It is so user focused and intuitive that it can give a good run for the money for alternatives like Kdenlive and Openshot. PiTiVi supports simple media editing capabilities such as trimming, snapping, splitting and cutting of clips. PiTiVi inherits its capabilities for importing and exporting (rendering) media from the GStreamer framework. Audio mixing is supported by curves, visualised as line segments drawn over an audio waveform. Audio and video clips can be linked together, and treated as a single clip. Watch this PiTiVi demo video. Watch more Movies made with PiTiVi. Me Menu is not an application as such. You can see the Me Menu in action in the above screenshot. Me Menu is a small text box in the right side of the top panel in your Desktop. And you can update your status in all your instant messaging services and social networking sites using Me Menu in one shot. Me Menu gives you an all integrated unified experience, which is cool. Me Menu is definitely a step in the right direction. Me Menu is designed to work with the default Empathy instant messaging client and the social networking functionality of Me Menu is powered by Gwibber. Again, not an application as such. But Ubuntu Music Store more or less acts like a plugin with media player applications like Rhythmbox, Banshee, Amarok etc. But by default, Ubuntu Music Store will come with Rhythmbox, which in turn is the default music player in Ubuntu. 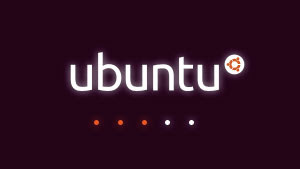 We had an entire post featuring Ubuntu One Music Store. 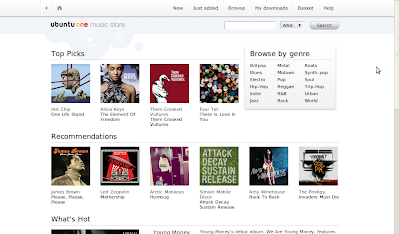 Ubuntu One Music Store is Coming to Rock Your World. Thats all for now. Another beta is on its way and we will be back with more. Meanwhile you might want to consider Subscribing To Our Daily Updates and Don't Ever Miss a Post!